Click for the full-size flyer. The pool at Marquette Park opens on Saturday, June 4th. 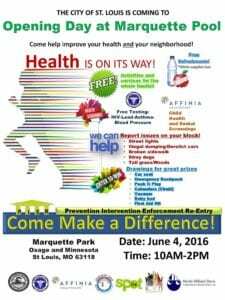 The City of St. Louis PIER Program (Prevention -Intervention-Enforcement-Reentry) will be there hosting a PIER Neighborhood Focus Fair. The fair will offer free resources such as health screenings from Affinia and gun and fire safety education from the Police and Fire Departments. Citizens Service Bureau representatives will be available to discuss neighborhood concerns such as nuisance properties and broken streetlights. There will be drawings for prizes and free food and drinks while supplies last. 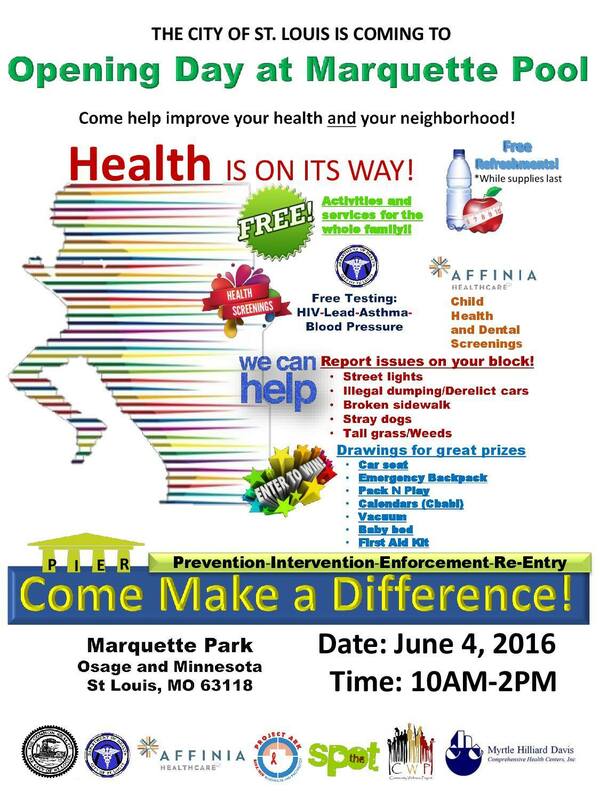 Come to Marquette Pool on Saturday June 4th from 10am — 2pm to take advantage of these free resources to improve your health and the health of the City! This post was updated on May 29, 2016 .